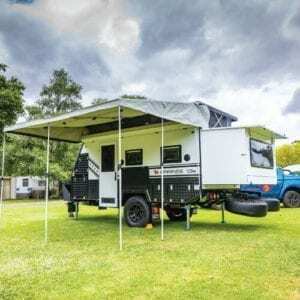 With the pleasant climate and endless destinations here in Western Australia, it’s no wonder more and more people are investing in off-road caravans as their holiday home. Unlike a vacation property, buying caravans in Perth allow families the chance to explore different locations each time they travel – which adds to the excitement of it all. Off for an extended trip around Australia, an off-road boys’ trip, or a short family weekend trip? At PMX Campers, we have a range of caravans for sale to suit your individual requirements. What Type of Caravan Should I Buy? How Many People Will the Caravan Sleep? This is crucial as it will determine the size and ultimately the cost of your caravan. PMX Campers have a range of off-road caravans for sale to suit everything from the single adventurer up to a family or group of 5 travellers. What Is the Maximum Tow Capacity of Your Vehicle? An important factor to take into consideration when choosing a caravan is the maximum towing capacity of your current vehicle. The bigger the caravan, the more towing power you’re going to need. You also must ensure your vehicle meets the criteria. Here at PMX Campers, we have experts on hand who will be able to determine what the towing capacity of your vehicle is and select the corresponding caravan to complement it. Where will you plan to take your caravan? This will give us a great indication on which caravan to offer you. Typically, our caravans are best for off road use, but their versatility means they are also perfect for comfortable family trips to a holiday park. What Features Would You Like Your Caravan to Have? These are inclusions that are unique to each buyers’ situation. A fully equipped ensuite is essential for one person who takes their caravan off-road and needs their own bathroom facilities. Other travellers may require a large-sized annex. For those who are temperature conscious, our conventional caravans are all fitted with state-of-the-art insulation that keeps you cool in summer and toasty in winter – it’s also proven to be an excellent sound proofer! At PMX Campers, we always strive to find you the best caravan to suit your needs and within your budget. We have the off-road caravans Perth needs to travel comfortably. Call us on (08) 9455 1454 or visit one of our showrooms in Perth to see our range of conventional and off-road caravans. Contact us online for more information!